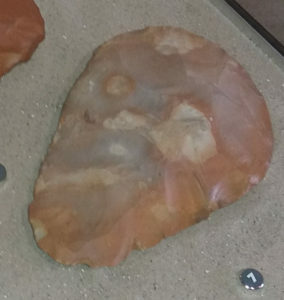 It is not easy to imagine, but humans were living in the Ashley area thousands of years ago. In the last century, three stone-age hand axes from the Palaeolithic era were found in Ashley gravel pits. The axe pictured below is on display at the Red House Museum in Christchurch. The earliest documented mention of Ashley, however, is in the Domesday book, compiled in 1086. Here, Ashley is referred to as Esselei, an Old English word meaning Ash wood or clearing. Specifically we can read that “The sons of Goderic Malf hold 1 hide (about 120 acres) in Ashley”. Another entry in the book informs us the Earl Roger “has himself 5 ½ virgates (roughly quarter of a hide) in Ashley”. From these entries we know that landowners in Ashley were both Anglo Saxon and Norman at that time. It is difficult to trace the history of Ashley during the middle ages, although we know there was a manor at Ashley, and that it merged with the neighboring manor of Arnewood at some point. There are various references to Ashley in the Christchurch Priory Cartulary, compiled in 1372, which are of interest. In the late 13th century, for instance, one record, confirms that inhabitants of East Ashley were worshipping in the chapel of Milton, rather than the church at Hordle. 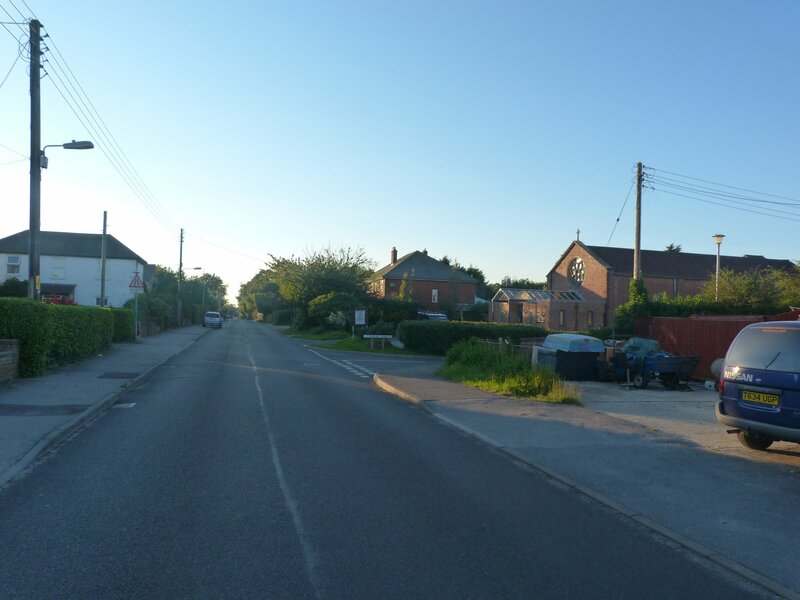 Another reference is to links between East Ashley and William de Farnhulle, a local knight, telling us that he owned land and entitlements in Ashley, as well as in Milford, West Barton, Arnewood and Northweye (? North Sway) that supported his position as knight. “ The vill of Ashley (Assheley) with the hamlets of Fernhill (Farnhulle), Downton (Duneketon’), Milton (Midelton’), Barton (Bermyntona) and Gore answer as one vill”. a vill is larger than a hamlet. Ashley has been a rural area until fairly recent times. Although straddling a sizeable area from north to south, the Danestream is a natural boundary on the east side, as well as acting as the parish boundary between Milton and Hordle. 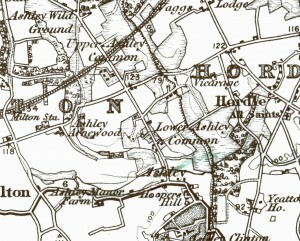 The common, to the east of Ashley Common Road was not enclosed until about 1862. 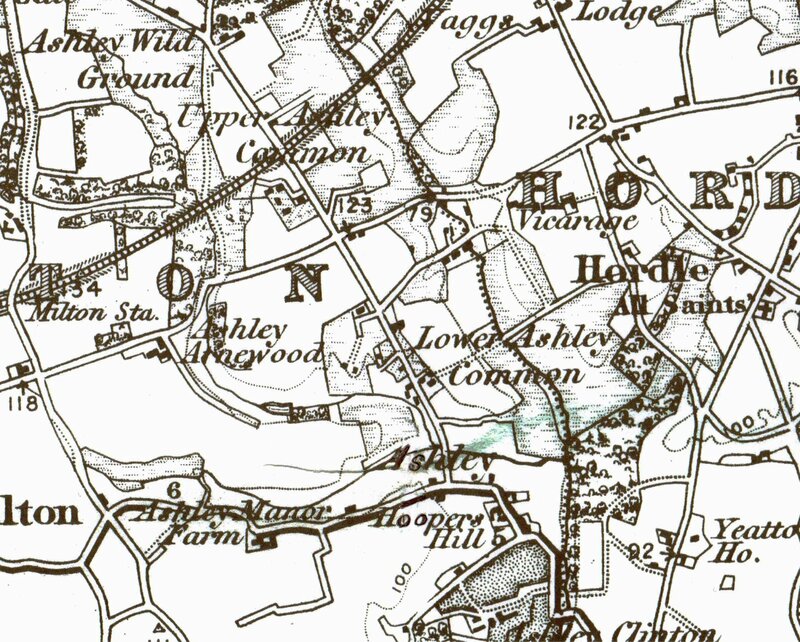 This extract from the Ordnance survey map of 1888 gives a good idea of just how undeveloped the Ashley area was with Lower Ashley Common, Upper Ashley Common and Ashley Wild Ground. Thankfully, three sets of allotments up and down the road that ran through the old Commons still give local people a chance to use the local ground; a legacy, perhaps, of access to ground that was lost. Ashley has for many years thrived as a religious stronghold. In particularly the Baptist creed of Christianity has taken root in this area of our town. The first Baptist church was noted in Ashley in about 1809. In 1820 a chapel made of ‘cob’ a popular local material of mud and pebbles, was built. 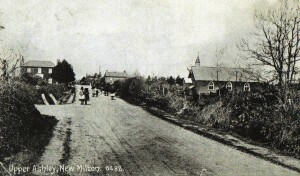 The Chapel shown in this postcard dated 1910, was built in 1899. The current Baptist church was built in 1993. Compare the scene with this photo taken in 2011.
is a modern day view for comparison. The brick church of St Peters church was built in 1957. 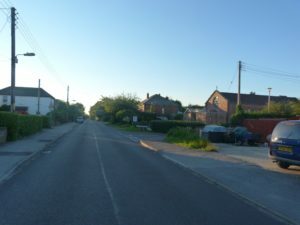 There is a wide variety of housing in Ashley, reflecting the history and development of the area. In Ashley Common Road there have been humble thatched cottages. Further up the road there is Stanley Estate and manor house, which is now a caravan park. There is a mansion house at Ashley Clinton, which was once home to General Sir Henry Clinton, who fought at the battle of Waterloo. 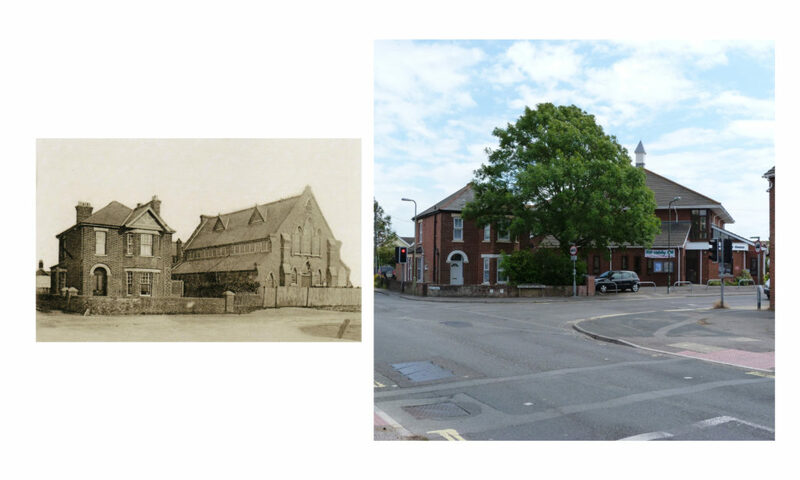 On Ashley Road there is Ashley Arnewood house which now a nursing home but was once the home of the Herbert family. Aubron Herbert was the son of the Earl of Canarvon and he lived at the house for some 12 years. Sadly his son, called Aubron Thomas Herbert was killed in action whilst serving as a pilot in the Royal Flying Corp in 1916. Perhaps the strangest accommodation to be found in Ashley was the railway carriages which were purchased and moved to Ashley Lane in 1925. Originally there were five but by the 1990s there was just one left. The carriages had been bought by a business man who used one of them as a holiday cottage. They were made of solid teak and were preserved under numerous layers of paint. The New Milton advertiser and times reports that the last carriage was demolished in 1998, despite the last owner offering it to several railway preservation societies. 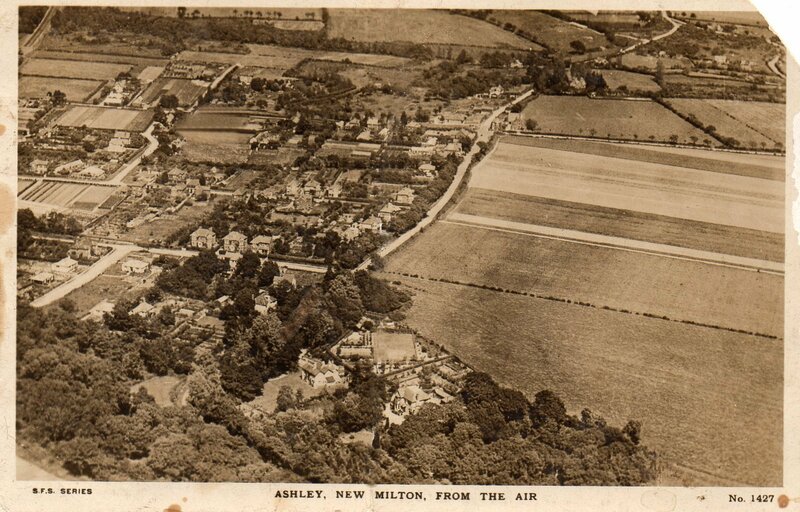 In 1947 the housing shortage was such that the first ‘prefab’ accommodation in the New Milton area were erected in Ashley to alleviate the situation. The ‘prefab’ bungalows were clad in aircraft aluminium. The building measured 30 feet by 22 ½ half feet. The cost of the bungalow was £1000, inclusive of transporting from the workshop to the site and connections to water, electricity and drainage. The first school was built in Ashley in 1879 in Hare Lane. It was a non denominational school. It ended its days as a ‘special school’ before being demolished in 1987. In 1939 Ashley secondary school was opened. Soon after the school played host to a large number of school children who were evacuated from Southampton to New Milton to avoid the blitz. One of the teachers who accompanied the children from the city was Mr Eric Wyeth Gadd. He wrote a book about his experiences in wartime New Milton. The book is called ‘Hampshire Evacuee’ and is a good record of World War Two in our town, seen from the civilians’ point of view. 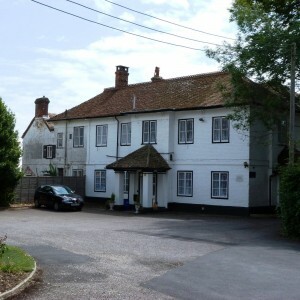 One of the best known teachers at this school was the late Arthur Lloyd, New Milton historian par excellence. 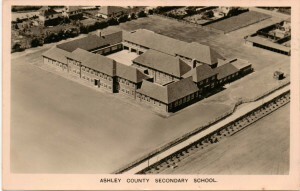 This photo shows Ashley school in soon after it was opened in 1939. 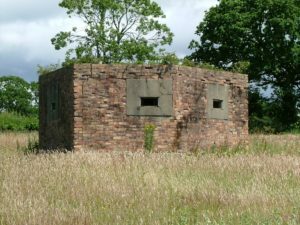 Other reminders of the second World War years are the defensive pill boxes in Lower Ashley, and the aircraft hangar which is part of Ashley garage. Ashley and New Milton have now built into each other but Lower Ashley, in particular, retains much of its rural identity. The days of Ashley Wild Ground and the common are long gone, but not forgotten, particularly if you explore local short-cuts through housing developments that replicate rights of way and pathways from earlier times. Ashley continues to thrive. It has a small shopping parade, which includes a chemist, hairdressers, and food outlets, as well as a supermarket in what was once the local pub. There are two schools and churches, with plenty of good housing in the area. In addition Ashley is now the home of New Milton Rugby club. Overall, a great place to live!